Line bundles and cohomology of toroidal groups differ in a significant way from the compact torus case. KOPFERMANN in 1964 used the characteristic decomposition of automorphic factors. 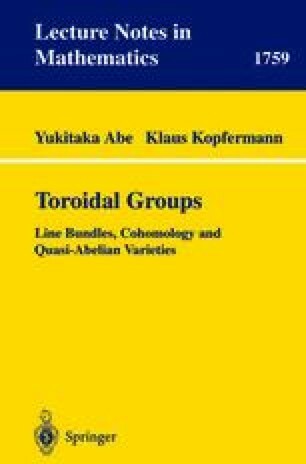 Vogt studied in 1981/82 line bundles on toroidal groups in general. He distinguished between toroidal theta and wild groups. Vogt and Kazama calculated the cohomology groups of theta groups. KAZAMA and Umeno determined the cohomology of toroidal wild groups and even any complex Lie group by studying their maximal complex subgroups.